We LOVE Kids! Your Ideal Restaurant For Budget-Conscious Families. 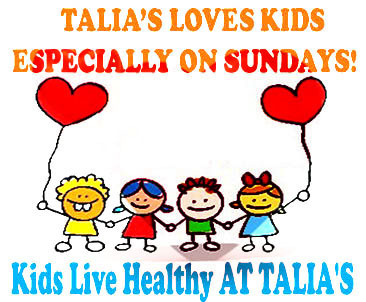 Although Talia’s features itself, among other things, as one of the best romantic Glatt Kosher restaurants NYC with live music, every Sunday, for over 16 years, Talia’s becomes a very kids and family friendly restaurant. During the spring and summertime, Talia’s sidewalk café is like a mini picnic area, full with kids and strollers. At Talia’s, “kids friendly restaurant” means a lot more than simply offering chicken fingers, a few crayons and a place mat for your child to color. Talia’s kids menu focuses on healthy options such as vegetables and low calorie, no saturated fat, low sodium, high in fiber side dishes and entrees. Sharing your adult plate with your kids is encouraged. Below, please review the items available for your kids. Of course, we also have typical kids friendly items (which, in our opinion, aren’t the healthiest foods in the world) such as burgers, hot dogs, chicken fingers, french fries, etc.